A remarkable purity to notes of pepper, violets and an unmistakable Syrah gaminess. Northern Rhone inspiration with Californian roots. Vineyard age is approximately 30 years old-Sandy Loam soil typical for its proximity to the Mokelumne River. Old World Syrah-Pushing our Northern Rhone tendencies. Savory, lifted aromatics, crunchy red fruit-Yes, this is from Lodi. 100% whole-cluster, semi-carbonic, Native/Ambient fermentation & ML. It was pressed into neutral french oak barrels late August 2016 and bottled early March 2017 to capture its vibrancy. Consistently one of the highest rated and regarded Old Vine Zins coming out of Lodi. The newly released Zinfandel continues in this same line of elegance, structure and beautifully complex Zinfandel. Welcome to old school California Zinfandel. Planting Dates/Vine Age: approx. 75yr-85yr old* 1920’s era vines (Primarily)-Early 1940’s era vines (secondarily)-Current Stewards: The Leon Perlegos Family (Georgia, Jeff, John)-Original Owners & Founders: J.J. Zechmeister & C.H. Suess-Property info: Total acreage: 22ac, 18ac, 4 ac fallow. Native/Ambient yeast fermentation & ML. One time used & neutral French Oak barrels. A gorgeous, aromatic wine with an almost dusty rose petal like perfume. Fine balance, depth and structure. The first Tempranillo vineyard planted in Lodi. We are in love with the character that this block showcases. Sandy Loam soil typical for its proximity to the Mokelumne River. Native/Ambient yeast fermentation & ML-bottled unfined/unfiltered. It only sees neutral French oak. This wine will reward decanting or long term cellaring. Elegant, perfumed, lifted aromatics – balanced yet complex – just elegance in a bottle. West side Lodi but still within the Mokelumne River AVA- the famed and historic Bechthold Vineyard planted own-rooted in 1886. Believed to be the oldest Cinsault vineyard in the world. 100% whole-cluster, semi-carbonic, Native/Ambient fermentation & ML. It is a gorgeous wine with intense and complex aromatics. Full bodied with a pure texture and stunning concentration. An elegant and well integrated backbone of tannins, acid and minerality, the hallmark of Mt. Veeder. 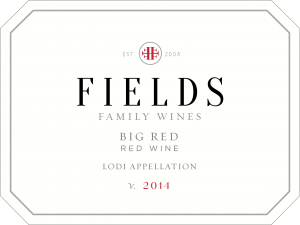 Fields Family Wines Cabernet Sauvignon comes from our own dedicated blocks high up on Mt. Veeder within Dr. Konrad’s Vineyard. Western facing slope, above the fog line. Truly unique. Native/Ambient yeast fermentation & ML. Approx. 30% New French Oak all other barrels are twice filled and neutral French Oak. Inviting aromas of lemon verbena, balanced but bright acid. The gorgeous white will immediately teleport you to an Italian coastal village, dining al fresco. The Alta Mesa AVA is known for its nutrient depleted soils comprised of sandy loam, clay and strata of decomposed granite. Fermented in tank. Blocked ML. Minimal SO2. 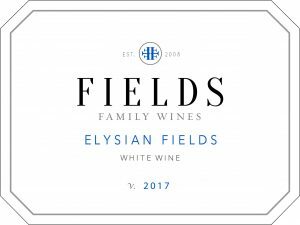 The finished wine was racked at completion of fermentation over to neutral French oak barrels to complete its elevage on its fine lees until filtered and bottled 3/2/18. 95 Cases produced. 50% Vermentino & 50% Grenache Blanc–Picked a full 7+ days later than the single vineyard bottlings. Pure California golden sunshine in a bottle. Super pretty and aromatic notes of tropical fruit, zesty citrus and baking spice. Fermented in tank & barrel. Blocked ML. Minimal SO2. Finished wine was racked at completion of fermentation over to neutral French oak barrels to complete its elevage on its fine lees until filtered and bottled 3/2/18. 98 Cases produced. A wonderful white wine to pair with more complex dishes. Crisp pear, beautiful spice complexity-texture, depth. Fermented in tank. Native fermentation, partially blocked ML. Finished wine was racked at completion of fermentation over to neutral French oak barrels to complete its elevage on its fine lees until filtered and bottled early January. Just a few cases remain. A dry provençal styled Rosé – silky mouthfeel with bright citrus notes. Laced with notes of strawberry, guava and stone fruits. Excellent with Salmon, Summer salads, shell fish, BBQ’s and Sushi. A Rosé for all seasons. Always a fan favorite. Pairs exceptionally well across many different food styles and dishes. Opulent black fruits (blackberries, black cherries, and cassis). The taste is complex and layered and leads into a lush middle palate framed by bright acid and supple tannins.